Any composer who tackles the piano trio form, as indeed I have, realises that he/she is stepping into a vat of music history, which goes back 250 years. All of the greats and most of the not-so-greats have attempted it and have found it a challenge and a delight. Any composer who finds his or her trio played by the Trio Ismena is doubly fortunate. The three lovely ladies and wonderful musicians — Monika Malmquist, Ida Norholm and Christine Raft — are so sympathetic to the repertoire and to each other that I can’t imagine any of these five composers being anything other than thrilled by the final results. One of the greats was Franz Schubert and not only does Pelle Gudmundsen-Holmgreen call his work Moments musicaux but he uses those famous piano pieces and indeed the Arpeggione Sonata, quoting them often. In fact the booklet writer Trine Boje Mortensen comments that “there is a very high percentage of Schubert in the work”. Why? The work was written to a commission for a friend who especially loved Schubert especially the sonata but, the composer comments, the effect of his piece is of “cutting him up”. He adds that “Ida will miss her Schubert - but on the other hand will get another – new-one”. The piece starts with the players tuning vaguely to an A. I’m not sure why. It then falls into four movements: 1. Talking, Shouting; 2. Mumbling (a sort of Scherzo); 3. Up Down, And dreaming; 4. Humming. Whispering. The effect is, in many ways, quite mesmerising especially in the last movement, which is the longest. Ultimately the novelties of the piece make it more of a witty and original experiment and not a work to repeat too often. 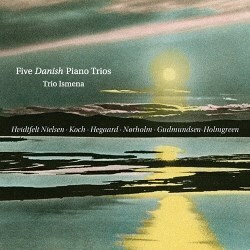 Of the same generation is Ib Norholm whose Piano Trio No. 3 is subtitled Essai in memoriam and according to the composer the “memory of music”. Perhaps he means his own as he is now coming up to 85. A composer friend who is keen on Norholm came round and we listened to the Trio together. The work is freely chromatic with occasional hints of tonality. My colleague talks about “post-romantic Norholmian contrasts of texture and dynamics”. It's true that we can move in a short space between serenity and violence — Alban Berg came to my mind. We listened also to Norholm’s Seventh Symphony (Kontrapunkt 32112), written in the late 1980s. There is a real stylistic consistency over that period and also, writ on a grand scale, is that contrast of the violently exciting and the calmly serene. Both works have a typical, apparently, throwaway ending. The Trio falls into three movements. The second is a brief Intermezzo of wit and amusement. In contrast the third is subtitled Conflitto but the moods of serenity, pleasure and conflict are all set up in the first movement. For both of those elder statesmen of Danish music the spirit of their teacher Vagn Holmboe hangs over them. No harm in that, you might feel. Holmboe lived on until 1996 and so for the next generation represented here by Lars Hegaard, Holmboe was possibly a less imposing musical grandfather. Hegaard has been a pupil of Norholm and is also known as a guitarist. Dacapo has recorded a disc of his chamber music (8.226501) but his name is new to me. His Like a Cube of Silence falls into five movements each prefaced by a quotation from a novel by Robert Musil (1880-1942). It's difficult to grasp how these lines inform the music but the middle one which is rhythmical and mostly homophonic is allotted the line ‘The vertical strictness of the universe’. The music can often be tonal but what is striking is again contrast: Scandinavian darkness against that bright light that I recall enjoying whilst standing in the magical coastal area south of Copenhagen. The title comes from the opening line, which inspires the first movement ‘Like a cube of silence the empty air stood in there’. An elusive but intriguing piece. Of a very similar age is Svend Nielsen who is represented by his four movement Divertimento; yes people still write them. I have to admit that I don’t find this piece particularly successful. The last movement, was commissioned to be a fanfare and not wanting a two and a half minute trio to stand alone the composer decided to add to it. Thus the first three have the “aim of putting the jubilation” (of the fanfare) … "into perspective". The first is called an Arabesque and is marked Fluente senza problemi. Its ebbing counterpoint is ear-capturing but no more. The very short second, an Intermezzo, seems to add nothing to the overall scheme and the Elegy, touchingly played, explores silence with a painfully long one at the end of the movement. Contrast is certainly achieved but the finale now seems too short after the preceding movement. So to the youngest of the five composers, Jesper Koch, also, alas a name new to me. He was also a Norholm pupil and it’s his Piano Trio that I have come back to. It's what I might call “proper” music. By that silly statement I mean that it is pure and unpolluted by any ‘ism’ or extra-musical affair. True the three movements have titles — Symmetries - Reflections - Contrasts — but the almost tonal material is energetic and thoughtful. It's always ear-catching and idiomatic and, as the useful booklet notes say, the work exhibits “a pleasure in story-telling and a playful approach to the seriousness of life”. I like that quote. So, for me only two works, those by Koch and Norholm, really strike home. Then again, that’s the fascination of the piano trio format. It offers so many opportunities to composers to experiment and to performers to explore their chamber-ensemble abilities. It's good then to have a chance to hear all five works so superbly played.